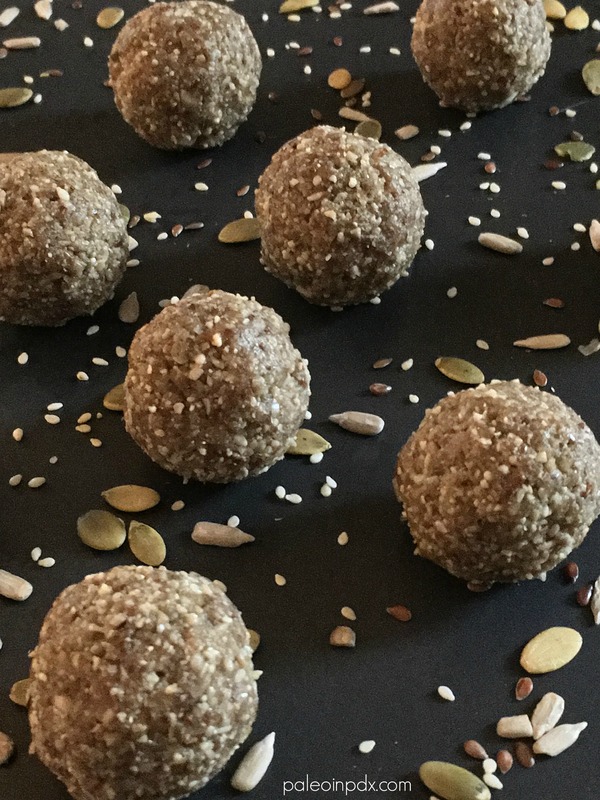 Making tasty little bites out of dates, coconut oil, nuts and/or seeds isn’t foreign to me, but these specific nut-free seedy bites are a new one. I can’t totally take credit for this combo, but I can take credit for putting this together and adding a couple ingredients of my own. Still, props to my friend and personal transformation coach, Joe Shoemaker for this creation and turning me onto seed cycling. A few months back, I went to Joe for a foot reflexology treatment and at some point during our session, he asked me about my cycle. Actually, based on the reflexology point on my foot (the spot specific to the reproductive organs), he was able to determine what my cycles were like and asked me if what he said was accurate. It was spot on. If you want to know, my cycles are pretty decent, overall and I really don’t have many complaints. I don’t really get PMS, cycles are moderate-light, but I do get some mild-to-moderate cramping on day one and occasionally a little on day two. That’s it, and that’s exactly what he repeated to me. On that note, he suggested seed cycling. He said it can help with cramping and any other PMS symptoms, and is something that has helped his wife immensely. His recommendation was to mix all the seeds together using dates and coconut oil as the “glue” and get a dose of the seeds that way versus the traditional approach. Yes, men and children can eat them too! Since adding these seed bites into my daily routine (I usually eat 1-2 per day), I have definitely noticed a change on the first couple days of my cycle. The cramping that I would generally experience is incredibly subdued and the seed bites are the only thing I’m doing differently. It still blows me away. It was noticeable on my first cycle after introducing these into my diet too! So, whether you believe the theory behind it or not, it doesn’t hurt to give ’em a go. If these don’t serve you in that way, you’re still getting a delightful treat. I know my ratios don’t match up exactly with the recommendations of the traditional approach, but I’ve found that it’s enough to make a difference for me. Feel free to play with the ratios though or try the traditional process if that’s of interest to you. Also, know that to get the full benefits of flaxseed, you need to grind it up. You can do this on your own in a grinder (coffee/spice grinder works great) or you can purchase ground flaxseed meal, which is what I did. If you don’t grind the flaxseed, it basically passes right through your system and it doesn’t break down in the food processor either. You can grind the sesame seeds if you want as well, but I find they break down pretty well in the food processor. *Note: I recommend using high-quality, organic seeds and sprouted, if possible. Add dates to the bowl of a food processor and pulse a few times or until dates are chopped up, but still chunky. Next, add the sesame seeds, sunflower seeds, pumpkin seeds and ground flaxseed meal, along with the sea salt and coconut oil. Pulse until well combined, scraping sides with a spatula as needed. 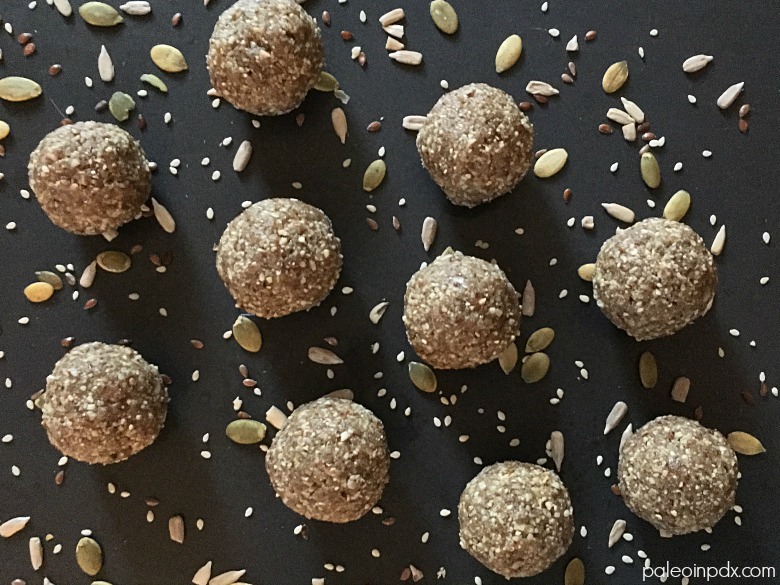 Roll into tablespoon-sized balls or so and store in the refrigerator. Alisa, you’re paleo, as am I; I trust your opinion. Hence, just out of curiosity, were the raw seeds you used in your *Seedy Bites* (I love that name for this snack ;D) purchased pre-soaked and dehydrated? Or, because of the overall health and balance provided by a truly paleo life(/fuel)style, do you simply focus on macronutrition in lieu of micro? You’re so welcome, Mae. And, thank YOU for your kind words. It’s very much appreciated!